I don't know about you but I reckon certain types of noodles have personalities. On my scale, soba is the introverted quiet one in the corner of a crowded room having a peaceful conversation, while in the middle of the party, ripping off its shirt, chugging beers and generally in everyone's face is ramen. Subtle couldn't be further from the truth. Udon is somewhere between these two extremes with a generally mellow vibe but is quite open to being led astray. Although I lean toward soba and udon most of the time, I was so excited to be in Kyoto that our first meal there really had to be a steaming bowl of ramen from Ippudo. 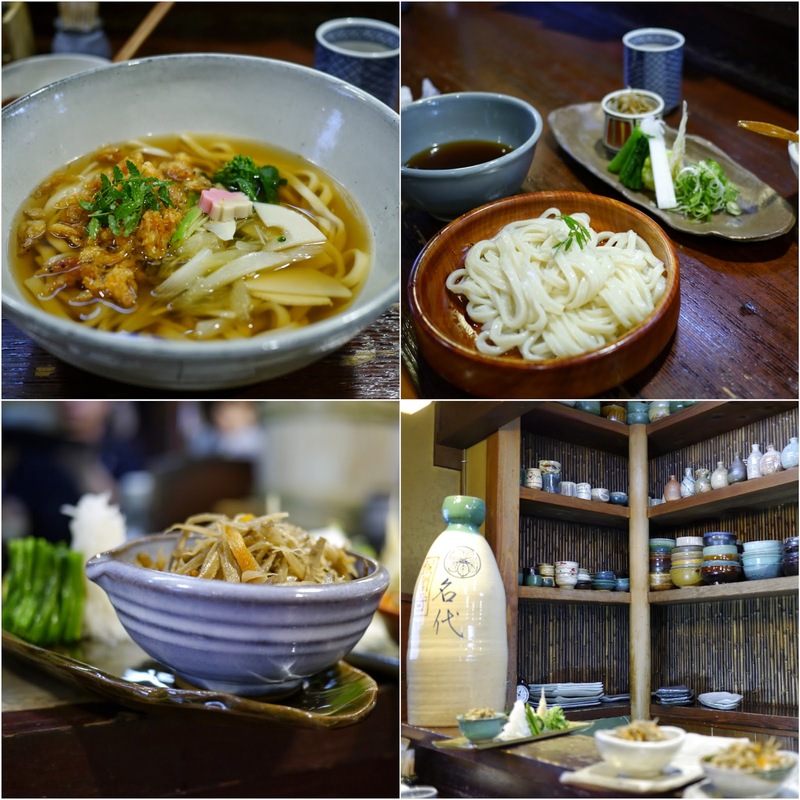 On other days I enjoyed an excellent cleansing soba in the terrific machi-ya of Misako-an and a stunning udon at Omen, a short stray from the Philosopher's Path on the way to the Silver Pavillion. All come highly recommended on any trip to Kyoto. If you know noodles, you don't need me to explain Ippudo's fame - it has locations spread from NYC to Sydney. It opened in 1985 in Fukuoka and has gone on to conquer the world except, oddly enough, London. Word on the street is that it's finally planning to wipe the floor with the current crop of London pretenders in the near future. 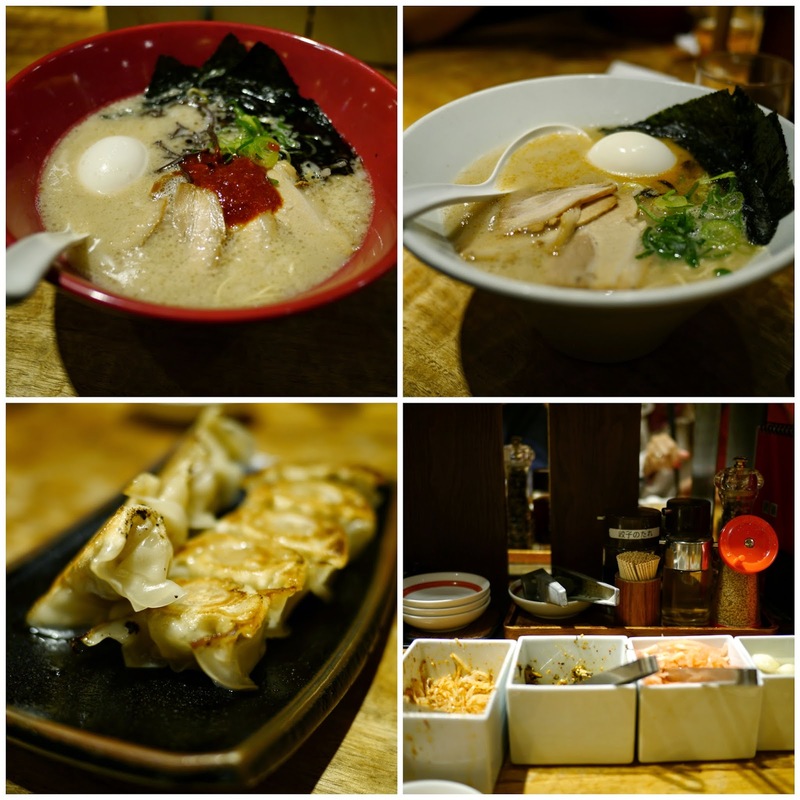 Ippudo's Kyoto location is a short walk from the end of the Nishiki market. We waited a brief time with a mix of tourists and locals before sharing a bench, ordering and tucking in. The menu selection is fairly brief with just four ramen variations to choose from and a couple of starters. The gyoza were terrific bite size mouthfuls served with a punchy little smudge of chilli sauce which I wanted more of. I ordered the Akamura special which was nose-runningly spicy and Dracula-warding with its garlicky oomph. Layered with charshu, three types of seaweed, bean sprouts, tomago and black fungus, it was a brilliant way to stave off jet lag. Mr B tucked into the classic hakata-style Shiromaru Special - the original milky tonkotsu broth with similar toppings to the Akamura bar the garlic - and slurped his bowl clean. The menu is in English and the staff are friendly, efficient and also speak English. True to its noodle personality, Ippudo is open late. 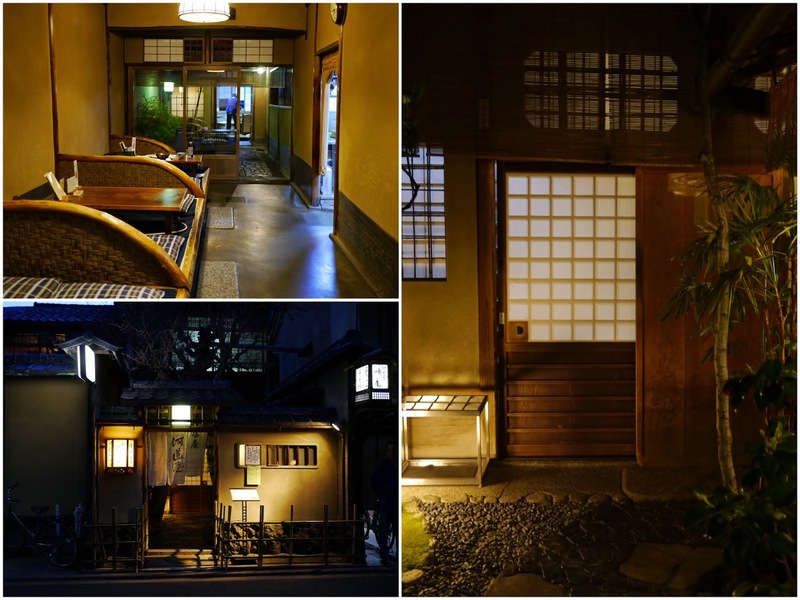 A little tip about the soba specialists in Kyoto is that they close early. I planned to try Daikoku-ya, but it was closing up at 8.30pm when I dropped in despite being smack in the middle of the Pontocho entertainment district (Diane Durston's Old Kyoto book lists it as open until 11pm, but it's not). I guess it reflects that shy, retiring noodle personality I referred to. 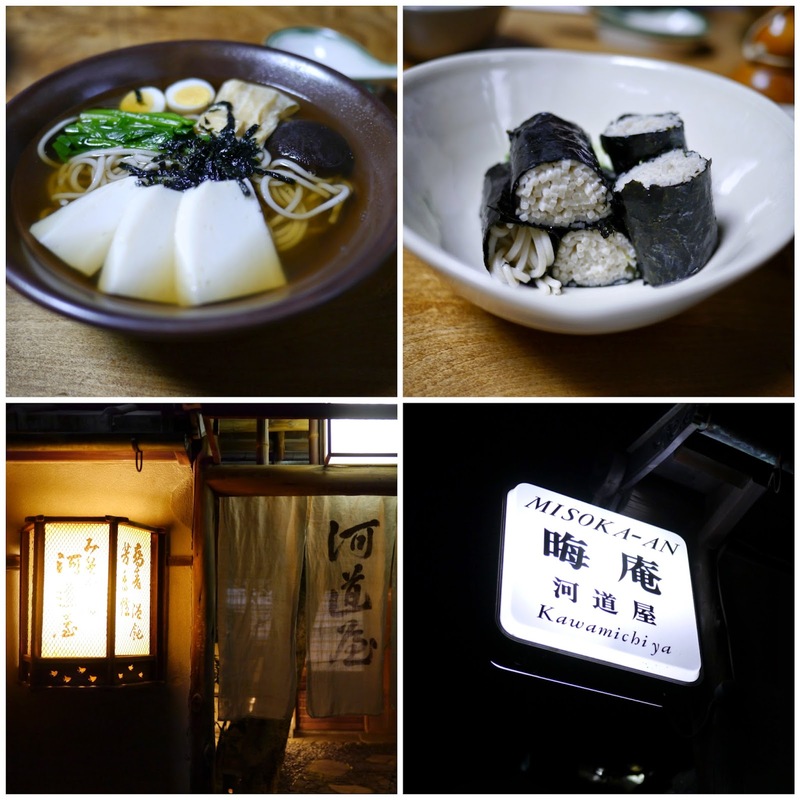 The one soba purveyor that I managed to try in Kyoto was Misoka-an and it's a must visit just to check out the building. I visited mainly due to reading about it in Old Kyoto which chronicles Kyoto's slowly fading machiyas or the traditional wooden stores used by the myriad merchants throughout the city. We sat at the back of the building which has stone floors, shoji screens, lots of foliage and an open ceiling in parts. It's a wonderfully atmospheric building. We decided to start with the peculiar maki rolls filled with soba noodles. They weren't an instantly likeable concoction to be honest - cold noodles wrapped in nori - but interesting to try nonetheless. As for the noodles, I picked the Shippoku soba. The small bowl was filled with yuba, shinjo (a fish paste), spinach, boiled quail eggs and some mushrooms. These are clean, bright but warming flavours. We missed the peak of cherry blossom season by about a week, but weren't too disappointed since the previous year we experienced the full blossoming in Tokyo. The Philosopher's Path is meant to be a stunning, if crowded, stroll at the peak of the season. We saw a few straggling trees with blossoms on the turn when we walked the stretch, but I was more looking forward to the udon noodles than the flowers. Omen udon: seasonal special udon, Nadai udon, sake, pickles. A short meander from the path will bring you to Omen. As you enter, there's a large tatami section to the right (which rapidly filled up with ravenous school kids) although we headed for the bar where one of the staff was sculpting small mountains from the vat of pickles. It's definitely got an old school vibe to it. I ordered the seasonal special udon called Wild Plant and Sakura Shrimp Noodle Soup for Y1,300 (£7.50 or so). Mr B took the house special noodles, Nadai Omen, served cold since it was a warm day. My beautifully balanced broth came with all the fantastic spring vegetables that we saw in the various markets and on menus that week like shredded burdock and bamboo. The sakura ebi, baby shrimp, were flash fried and added to the broth along with spring onions and small sansho fronds with their peppery numbing impact. The noodles, of course, were excellent - firm yet bouncy and elastic without being chewy. Mr B raved about his set. The cold noodles could be dipped into the soup or sprinkled with sesame seeds. The meal was made complete with an excellent pickle selection. For Y1,150 (not even £7) it was a bargain. Omen is run by third generation noodle makers and the attention to detail shows in each bite. We left hugely satiated with enough ballast to battle the thickening crowd on the approach to the Silver Pavilion. Kyoto's Silver Pavilion. Serenity now.